Ever get that feeling that you just want to get in the car and drive? Destination decided, money in your pocket , gas in the tank and off you go. I don’t get that feeling often these days, having two toddlers and a full time job has sort of reduced my desire to roam . Sometimes I still yearn to get out of Pembrokeshire and head to a city. 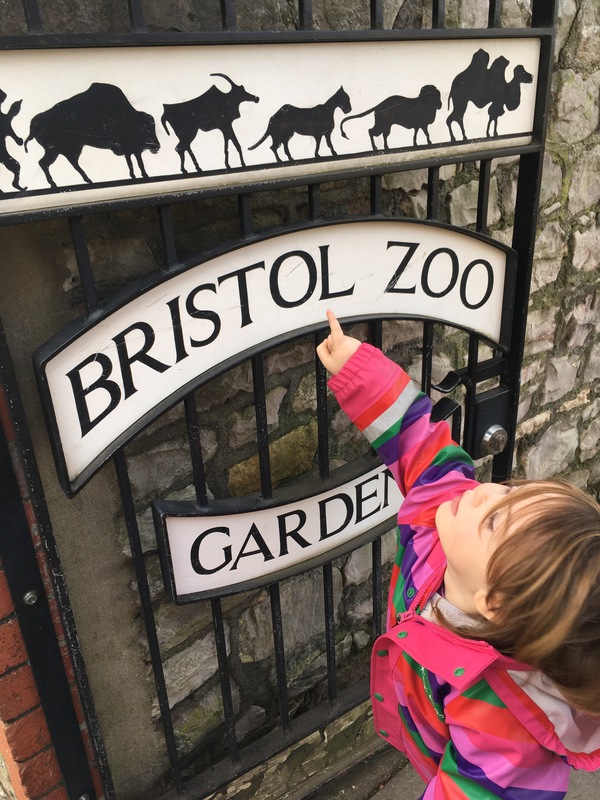 Last week, I gave in to the wander lust, and rather spontaneously took the mini farmers to Bristol Zoo. I have become a master at the art of preparing for ‘family days out’ , having honed my technique over the past three years. In under an hour we were breakfasted, dressed and in the car along with a picnic, things for the journey and spare clothes…as well as the potty, wrap and buggy. I even managed to charge my phone and check that the camera actually had an sd card in before chucking it into the boot. Parenting level up! Jock the silver back, nonchalantly chewing on a whole coconut. I love Bristol zoo. I love most zoos that I have visited in the UK, but Bristol zoo holds a special place as I have spent time here on a work experience placement. 3 happy weeks of helping to x ray tortoises, post mortems on crocodiles, anaesthetising macaques and carrying out health checks on endless Roul Rouls. 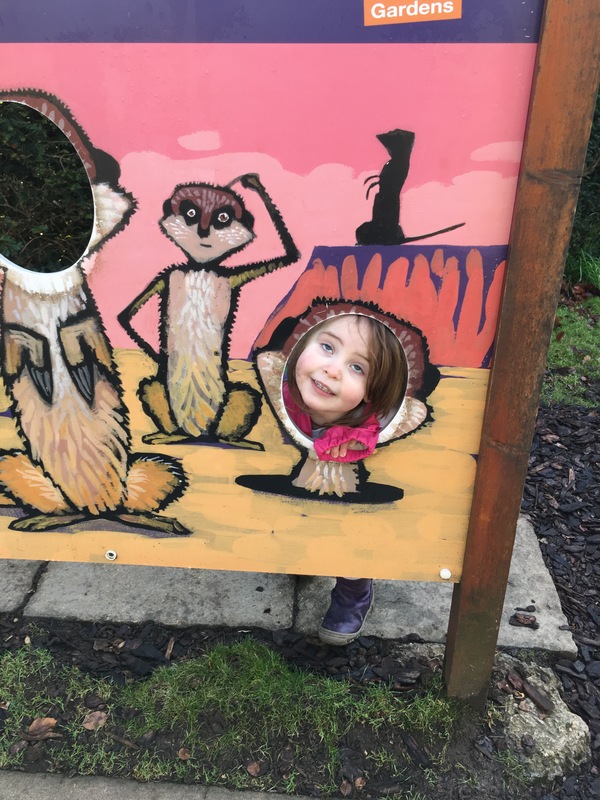 The 130 or so miles (yes, this was a long distance road trip) from the farm to Bristol zoo passed fairly smoothly- no poonamis, tantrums or vom sessions from the back seats, and only half an hour of ‘are we nearly there yet’, which I count as a win. The zoo is easy to find, and has plenty of parking on site. If your lucky you can find a free spot in one of the side streets, but I couldn’t be bothered hauling all the kids gear any further than I absolutely had to. £3 for all day safe and secure parking seemed reasonable (even cheaper if you are a member). We weren’t particularly early (12pm) but there was no queue for tickets- the first time this has ever happened to me! This is one of the reasons I love coming to places out of season. Another benefit is actually being able to see the animals. The lions were out in their enclosure, sprawling lazily in the weak January sunlight. The mini farmers managed to get up close to the glass for a really good look- normally if one is in the buggy they end up with a fab view of the back of peoples knees. Next up – Twilight zone. A bit of a struggle to get through the doors single handedly with the buggy, but once in we were fine. This series of enclosures has recently undergone a major overhaul, and it shows. After a bit of squinting (and staggering about myopically in my case) our eyes adjusted to the dusky light levels, we managed to see nearly all of the nocturnal inhabitants of this wonderful world. 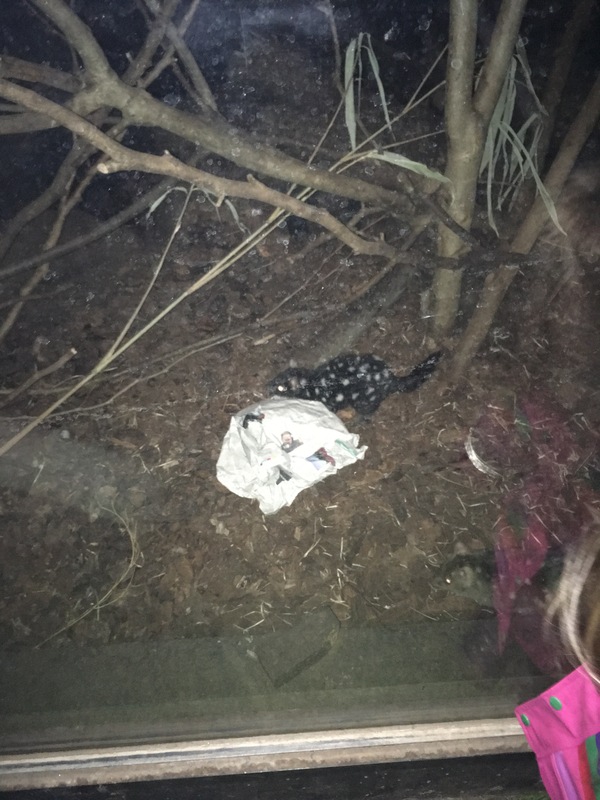 Quolls dashed about amongst the leaf litter, living up to their ‘tiger cat’ nickname.The desert cats prowled in their territory, pouncing on invisible prey. My favourites the aye aye clambered about in their shaky, alien limbed fashion. I love this area of the zoo and could quite easily have spent several hours in their, watching a secret, normally unseen world unfold behind the glass. C had other ideas ‘come on mum’ she said, disappearing out into the daylight ‘ my tummy is rumbling’. Guess it must be lunch time then?! I’m glad I bothered to make a packed lunch. Food at the zoo is pricey, and not that exciting to boot. There are vending machines dotted about too, but they are also £££. It will be interesting to see if this changes when the new zoo restaurant is up and running. We got to the Gorillas just in time to see them having lunch. I don’t like to anthropomorphise, but seriously its hard not to with Gorillas. Jock, the silver back, sat directly opposite where the keepers were lobbing fruit and veg from. One of the cheeky younger family members snuck up and stole a carrot-I swear Dad Jock rolled his eyes at him or her! I am also amazed at the story of Amina, the troops youngest member, who was born by C Section. Her birth mum had developed a condition similar to Pre eclampsia during late pregnancy, resulting in an emergency op involving human doctors as well as vets. If you look closely, you can spot her clinging on to her adoptive mums arm. And silly selfie props. We had to stop at every one once C had realised what they were! The outdoor playground packs a lot into a little space. It was the mini farmers favourite. Typical. I drive 100 odd miles and all they want is the play park. If you come in the summer, the water play area is amazing- don’t forget a swimming costume or a change of clothes plus a towel! There’s also an indoor activity centre, with crafts, colouring in, lucky dip and face painting for the over threes. C was turned into a butterfly, whilst JoJo explored an old haul from customs and excise, now turned into an educational display. 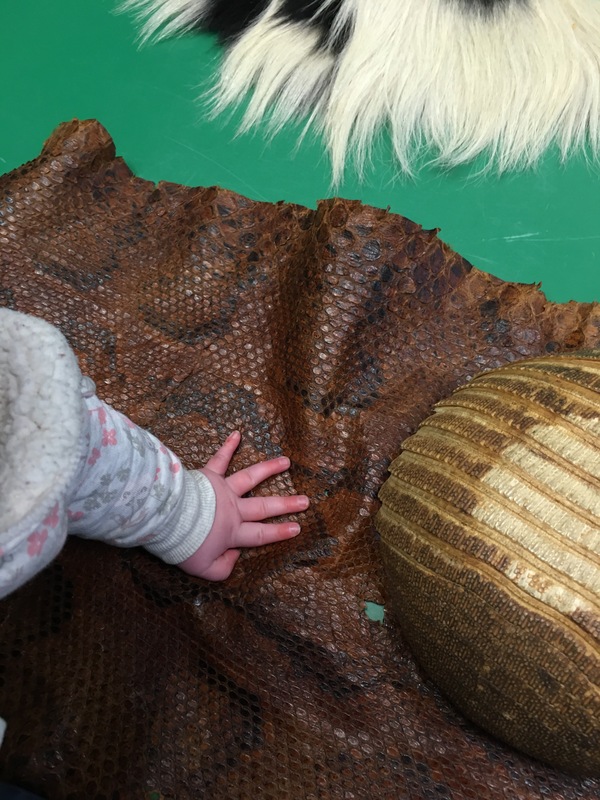 Snakeskin, possibly once destined for handbag and shoe production, now teaching sticky fingered toddlers the meaning of conservation. 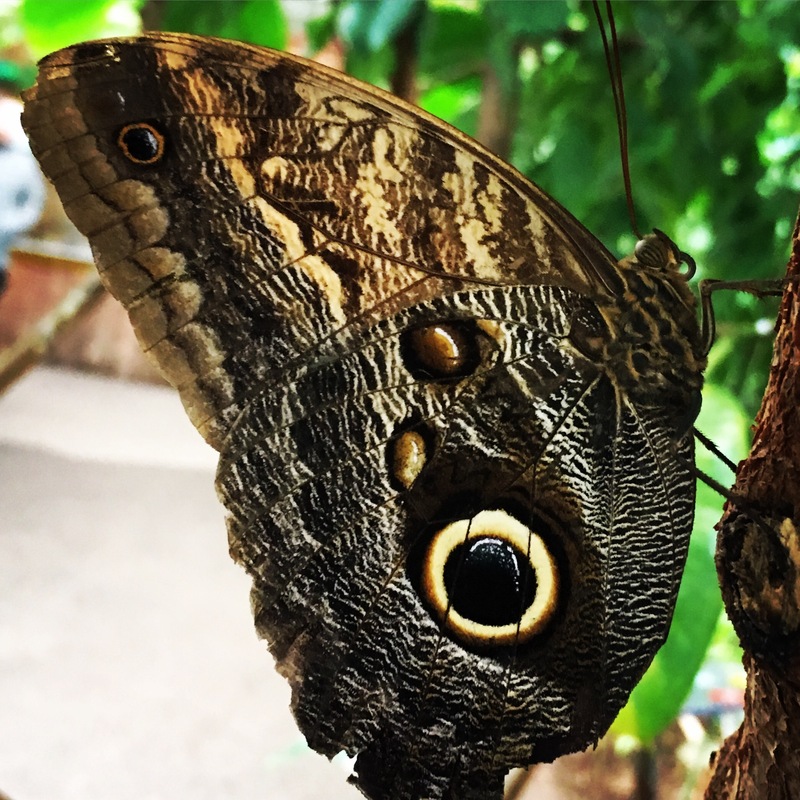 To escape the cold we nipped into the butterfly house. C wanted to look at the chrysalis whilst JoJo was mesmerised by the butterflies as they flitted about. I was a bit too…standing with head back and mouth open kind of mesmerised. Not a good look. We then headed back along through the fruit bat enclosure, stopping briefly to check out the Giant tortoises. These creatures are magnificient. Every time I pass here, I remember the day I got to go inside the enclosure on work experience. One of the tortoise, who is most likely still a resident, ambled over to me and pushed his head under my hand, encouraging me to pet him. The keeper remarked ‘yeah, he’s really just an overgrown, shelly labrador’! C checking out the giant, shelled Labradors. By this point we had probably seen about two thirds of the exhibits, but the girls were starting to show signs of tiredness. 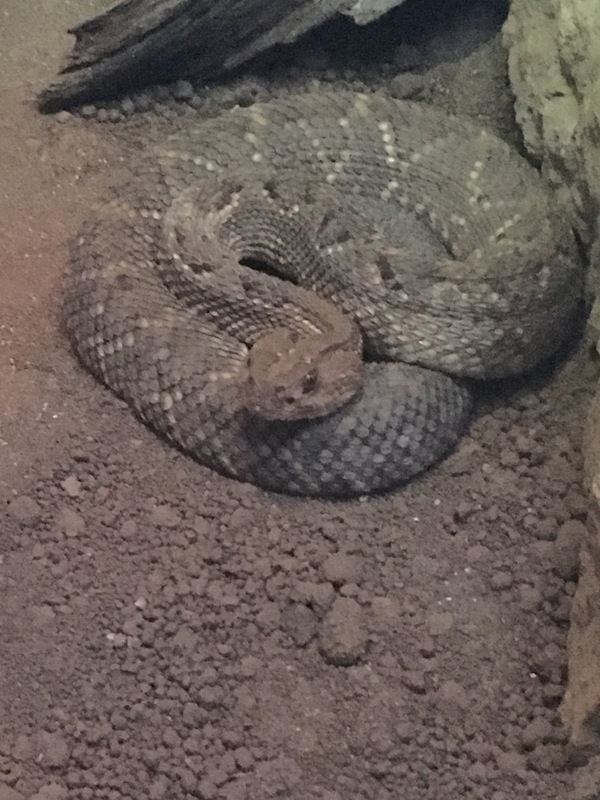 We quickly made our way through the reptile house, which we had somehow managed to time just right. The crocodiles were being fed…not as dramatic as it sounds, and pretty neat to watch. Feeding time at the zoo. Literally. Time to exit through the gift shop. I said each of them could have one thing. C made a beeline for a 3ft neon pink flamingo, claiming it to be the thing she really, really wanted. Somehow I managed to talk her down to having a pair of 30cm high macaws. JoJo got a Melissa and Doug jigsaw. We said our good byes for another day and started on our long journey home. 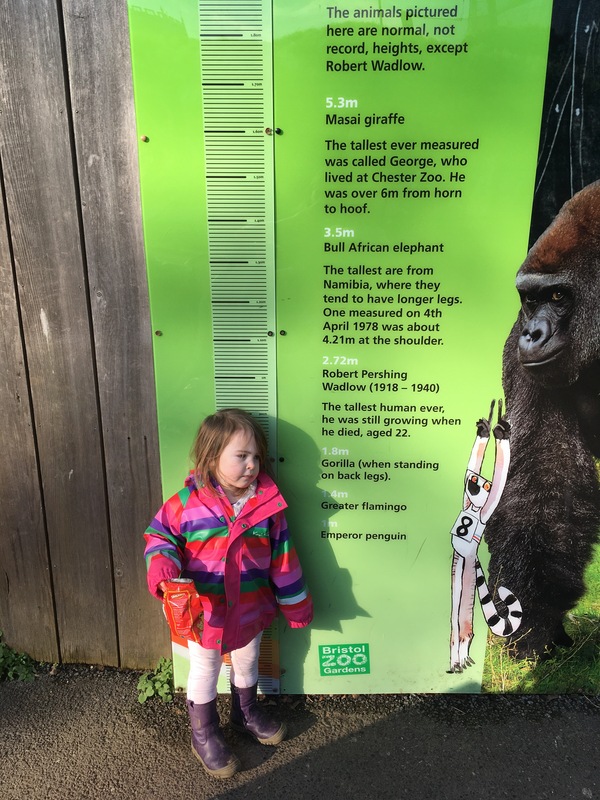 Bristol zoo, we love you! Pembrokeshire is quite a special place to live. Not only are we spoiled for choice when it comes to beaches, countryside and wildlife spotting opportunities there are many attractions to take advantage of too. Unfortunately these tend to come with a hefty entrance price. Soon we will enter the territory of ‘three and over’, apparently the age at which you must start paying for children. I have no idea why. Three year olds don’t take up that much more space than two year olds. 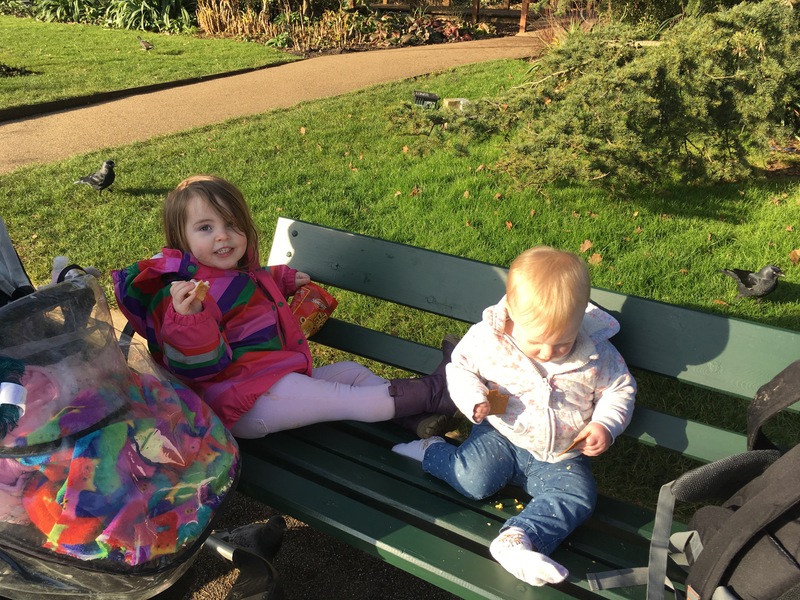 Anyway, I’ve decided to make the most of the last month of getting both children in free…well as least legitimately anyway. Anna’s Welsh Zoo is somewhere we have been before, and it has always been a lovely experience. Although it has competition from Folly farm, another zoo a few miles away, I have found it to be a completely different experience. From the minute you pull into the car park, it feels much more like a safari park than a zoo. It is spread across 52 acres of Pembrokeshire parkland, which provides a stunning backdrop for the animals. C was super excited. We hyped each other up a wee bit on the short journey to the park, singing back to back zoo themed songs (‘we’re going to the zoo, zoo, zoo…how about you you you?) and guessing which animals we might see (me- wallabies C- dinosaurs Jo Jo-I think she said ‘baa’ so I guess she meant sheep…probably). The entry price was actually very reasonable, just over £13 for me. I managed to push cost up by buying some ‘special ‘wallaby’ food (£1 a packet, seemed a bit overpriced for 3 pieces per bag, but I couldn’t say no.Walked myself into that one, well and truly). Once in, we made a pit stop at the hand washing station. To minimise risk of infection,visitors are asked to wash hands before and after going into the exhibits. As you can see, the stations are the perfect height for children. The walkthroughs are one of the best bits of Anna’s zoo. The animals are incredibly relaxed, and do not seemed stressed out by human presence at all. If they decide they don’t want to hang out with people, they have plenty of space and hideaways provided for them to retreat to. There are lots of signs up explaining how to get the most out of the experience. Basically the advice (very good advice) is to let the animals come to you. I was surprised by how much C enjoyed the wallabies. She even managed to feed some! We made it to the Lemurs just in time for feeding. This walkthrough is one of the largest of its kind in Europe, and it is amazing. Red Ruffed and Ringtailed lemurs are 2 of the 5 species that swing, lollop and scramble around this enclosure. And they come right up to you. C sat on a log next to one lemur who was busy stuffing a vegetable into his or her mouth. She had a lovely, if slightly one sided conversation about the weather, the colour of her shoes, and what the lemur was eating. The lemur was not bothered one iota. Jo Jo loved it too. She spent her time craning out from her buggy, making appreciative cooing and ahhing noises. To me the entrance ticket was worth just seeing the girls enjoy watching these amazing creatures. Lemurs and toddlers -in tune and at one. The Valley of the apes walkthrough is a bit of a misnomer in my opinion. I think it should be renamed valley of the funky gibbons, as they are the only species residing there. Still, what’s not to like about a gibbon. The Gibbon family were tucking into lunch when we got there. 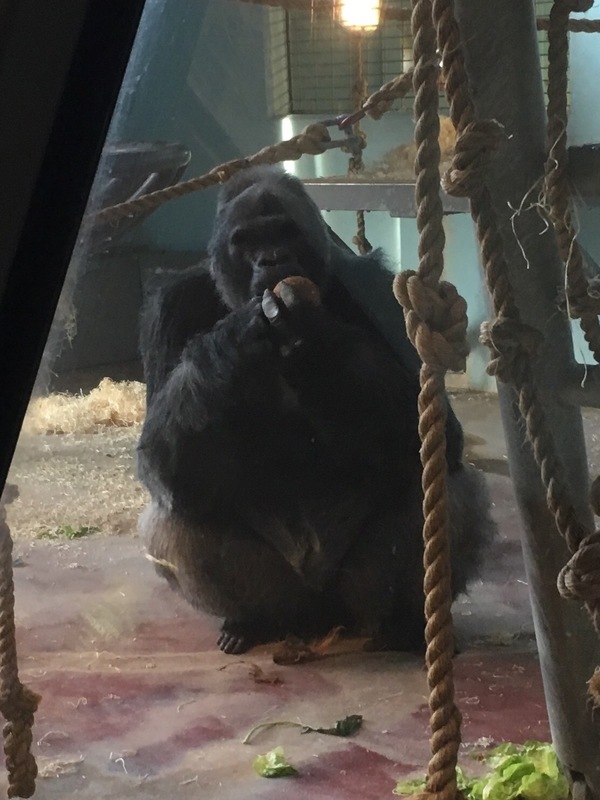 Steve, an original resident who predates the creation of Anna’s Welsh Zoo, was possibly feeling a bit antisocial as he went into his indoor area as soon as we arrived. We do tend to have that effect on some humans too, so I won’t hold it against him. The Warren with its Flemish rabbits is a recent addition. Jo Jo seemed to make pals pretty quickly, despite the fact that the rabbits were as big as her! The last walkthrough is the African Village, the inhabitants of which include Pygmy goats (including one who looks very preggers at the mo), a Spur thighed Tortoise, assorted Chooks and some Cameroon sheep. The girls were quite enamoured with one of the sheep. She was spread eagled in the middle of the path, and didn’t budge whilst they gave her a very gentle hug. The walkthroughs are probably only a third of what the wildlife park has to offer. The African Grasslands, home to rhino, ostriches and zebra, is what I imagine safari to be like. Obviously you also have to imagine the warmth, lack of rain and generally sunnier climate since we are in Pembrokeshire, but you get the drift. There are also Prezwalski’s horses, noisy Emu, Alpacas, Oryx, Capybara, Marmosets, Tapir and Camels in the park. No matter how amazing the animal enclosures are, the lure of soft play cannot be avoided. The new indoor area, installed this year, is fantastic. It is housed in three rather space age looking domes. One contains Little Tikes cars, rockers, wheelybugs and space hoppers. The middle one is a seating area and the other large dome houses a multi level soft play. I literally had to bribe the children to leave it. Slides, trampolines, ball pit…it had something for everyone. Normally soft play to me is akin to dantes 7th circle of hell. This one, not too shabby! The indoor hay play area proved great for letting off some steam too. There are some ‘traditional’ outdoor play areas with slides and climbing frames, as well as two huge sand pits.Then there are the assorted out door toys scattered across the front lawn, with the bouncy castle and dragon stage too. All of which can be seen from the outdoor seating for the café. I broke one of my cardinal rules and bought lunch today. Fortunately it was yummy. The girls had a cheese sandwich to share between themselves and the ‘Ostentation’ (that really is the correct collective noun) of peacocks that loitered around our table. I had a vegan onion Bhaji sandwich and seriously good coffee. There are hot options available too, and the café is very child/baby/breastfeeding friendly. I broke another cardinal rule by stopping in the gift shop. I couldn’t resist a Koi Carp wind sock (god knows where I will hang it) and the girls had a toy snake each. To be fair, there is a lot of choice, with many affordable items and everything is zoo related. By now the girls had started to become tired and cranky so we called it a day. Hopefully we will return soon, so we can make use of the bubble ticket (buy twice, go as many times as you want) before the inevitable third birthday! This morning I had Ospreys in my kitchen. Ok, ok , it was on a webcam, but it was still pretty cool. Today started off as another bleak rainy grey day. Hunkered down in the kitchen with my morning coffee I wondered how I was going to fit something wild in without getting absolutely soaked. Fortunately my random act of wildness cards held the answer: Watch a wild webcam (Peek at Osprey, Peregrines and other wildlife). I decided to take the card literally (as baby brain and sleep deprivation make independent thought tricky) and typed ‘Osprey’ into the search engine. The first webcam that popped up was the Scottish wildlife trusts camera on the loch of the lowes. I opened up the website and settled back to finish the rest of my cuppa. My kitchen filled with the sound of wind blowing gently through the boughs of the Scots pines on my screen. The sound of birdsong mingled with the occasional noisy goose honk from the lake below. I counted 3 large, dappled chicks, spread eagled in the nest. A large adult stood guard over the snoozing chicks, crest feathers ruffling in the breeze. I sat and watched in amazement. I couldn’t quite believe that ,thanks to the wonders of modern technology, I was able to watch live feed streamed from a camera pointed at an eyrie hundreds of miles away in Scotland. In my opinion, this is what the internet is made for! After 10 minutes the chicks suddenly sprang to life. There was lots of wing stretching and preening as the chicks woke, and wobbled around the nest. Shortly after I was excited to see the other adult bird return, to a chorus of cheeps and shrieks. I could have sat there all day, but unfortunately I had lots of boring chores to get through before C came home from nursery. In the meantime I have managed to learn about the family in whose nest I was a ‘fly on the wall’, thanks to the rather informative blog running alongside the webcam. Loch of the Lowes has been home to Osprey since 1969. The female on this nest, known by the rather catchy LF15, is a relative newcomer who arrived in 2015. LF15 replaced ‘Lady’, who had nested on the Loch for the last 24 years, but didn’t return from North Africa this breeding season. The Average lifespan of an Osprey is 10 years, and Lady was estimated to be 28! She had clocked up an impressive 129,000 flight miles and successfully fledged 50 chicks in her lifetime. LF15 now has her own brood of 3, . Her mate, LM12 is also new, with an unknown history. I couldn’t distinguish between th adults well enough to work out which bird was which. Apparently female osprey are 20% bigger than males, and have a ‘necklace’ of brown feathers on their chest. I did check back later this evening. One parent was still on guard, resting on one footing with the other leg tucked up under its body. The chicks were all asleep; the camera quality was so good I could count their breathes. Suddenly the adult started ducking and twisting its head at something off camera. It let out a rapid high pitched ‘chee chee’ call-a warning or a welcoming call? I wasn’t sure. I waited a while in case the other adult arrived back in the nest with dinner, but nothing more happened and the adult settled back to resting. I’m definitely going to have to tune back in to this webcams again.It was a refreshing change to my usual Monday night of channel hopping, trying to find something semi decent to watch.From now on i’ll be watching ‘Osprey Cam’! Last week I took the girls to the Wildlife Trust Centre in Cilgerran. I have been coming here for 2 years, and each time we visit I fall in love with the site a little bit more. I parked the car and unpacked all of the many,many bags I now need when travelling out with a toddler and baby. Somewhere in the wood behind I could here the tak-tak-tak-tak of a woodpecker drilling away at a tree. Once I had unloaded the girls and paid the parking fee (£3 all day, free if Trust member, not too shabby) we headed up the short, buggy friendly path to the visitors centre. This is an impressive structure spread over 3 floors. It houses a shop and a glasstop café (as well as the loo!). You can wander right out from the café onto a meadow overlooking the Teifi Marshes and Cardigan town centre. There is a nice children’s corner full of colouring activities, and a comfy Seal cushion to sprawl on whilst watching the world go by. The shop also has ‘activity backpacks’ available to hire, and as the girls were in a good mood I decided we should try one . They don’t cost very much at all (£3 with a £10 deposit) and are full of things to occupy little Naturalists. You could spend a whole day just completing the 8 activities, never mind using the rest of the kit! The activities range in difficulty from toddler friendly ‘crown making’ and bark rubbing to more advanced wildlife spotting and geocaching . We had the choice of the camo or a blue backpack, C opted for the ‘authentic look’! We took our kit up to the picnic area and spread the contents out on a table. I had a quick look through the activities and decided which were most appropriate for today. The activities range in difficulty from toddler friendly ‘crown making’ and bark rubbing to more advanced wildlife spotting and geocaching . C immediately claimed the binoculars and magnifying glass for herself, and we set off on our adventure. Contents of the backpack; magnifying glass, collecting jar, binoculars, map, guides and 8 activities. From the sheltered picnic area we went to pay a visit to the giant willow badger. As we got closer I noticed something sitting on his nose- a hand knitted bee. It had a label attached to it, which rather reminded me of Paddington bear! We dutifully followed the instructions, and C carried the bee down the hill in her imaginary ‘ambulance’, complete with ‘nee naw’ siren! At the bottom of the hill the path splits, with one trail heading off to the river. We took the other fork, following the ‘Explorer trail’. At 0.75km this seemed the most toddler and buggy friendly option. It still took quite a long time as C kept stopping to examine things with her magnifying glass. We looked at leaves, twigs and even an ant up close. I spotted a blob of ‘Cuckoo spit’ on some plantain. This frothy liquid is produced by the nymph stage of Froghopper insects, and despite its name has nothing to do with Cuckoos. The path winds through a blackthorn coppice and some deciduous woodland. Eventually you get a fantastic view over the whole of the Teifi Marshes before returning to the car park. We weren’t finished yet. C was pestering to go to the adventure playground, so we trundled off along the drive. The playground could fill an afternoon in itself. C and F spent ages on the slides, clambering on the wooden balance beams and popping in and out of the tree house. Eventually they had had enough, and we decided it was time to visit the pond. By now F was asleep in her buggy, and with C contentedly munching on raisins I settled on the jetty to take some photos. Whirlygig beetles careered across the surface like miniature dodgems.Metallic flashes of blue and red whizzed between the reeds, damselflies . Most of the blues seemed to be flying solo, but the Large Red Damselflies were locked together. Damselfly mating is a tricky and acrobatic affair.The male holds on to the front of the female (prothorax), whilst she curls herself around his reproductive organs. The shape their bodies form is called a ‘mating wheel’. I managed to take a few semi decent photos (and got one foot a bit soggy trying to get a ‘macro shot’) before JoJo started to stir .It was time to head back to the visitor centre and hand in the rucksack. It had been an eventful day, and both girls were asleep before we pulled out of the car park. Bonus! C and her magnifying glass. For info on how to get here go to the Wildlife Trust website.